This gag appears in the new edition of Reader's Digest in the UK. It was in one of my sketchbooks for a long time before I got around to drawing it up, possibly more than a year. I simply didn't think it was that strong an idea, but that may have been because it was just sketched vaguely, with the characters in indistinct "olde worlde" garb. 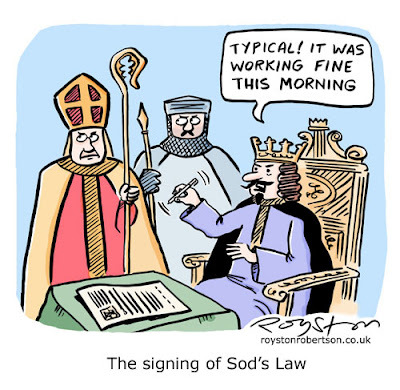 It was only when I started to develop it visually, using pics of the Magna Carta signing as reference (thank you Google Image Search), that I could see it was beginning to work. It's always bizarre how cartoons come together. Sometimes the complete opposite happens, the cartoon forms visually in your head at the same time as the gag. I only drew it up to make up the numbers in a batch of cartoons, but of course it was the only one that the Digest bought. This happens a lot, as any cartoonist will tell you. 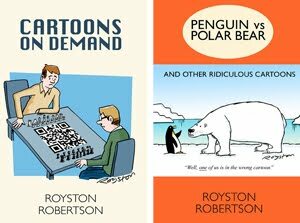 i'm surprised it took you so long to realise that's a really nice gag -- although of course i've done the same sort of thing..
Nice cartoon Royston. Looks great and it's funny. Nice to see the brush pen being put to good use, livens up the artwork no end! Not that your artwork wasn't lively before, what I merely meant was ... I'll shut up now.